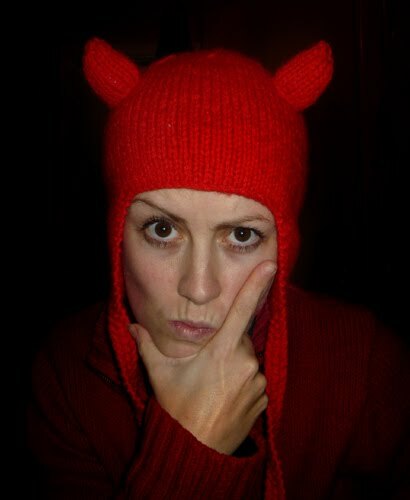 The Kat's Scratch Pad: Kat's Devilish Ear Flap Ski Hat "Two Sticks"
Kat's Devilish Ear Flap Ski Hat "Two Sticks"
For you little devils out there, I've added some groovy horns to my ear flap hat - If you wanna make a statement then this works! I must confess I rather enjoyed the smiles I got whilst wandering around the supermarket with this on my noggin! You'll need a gorgeous red chunky (bulky) wool, and a bit of stuffing for the horns to make them stay nice and upright. Once you've made your hat, it's time to make the horns! Repeat for your second horn. Now sew down row edges to make the horn shape and stuff firmly. 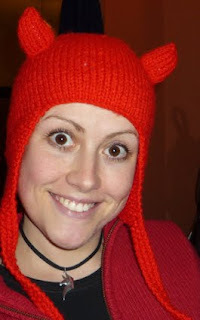 Placing your ski hat on your head, have great fun working out the best placement for your horns! You can have them sticking out of the top like mine, or they also look nifty coming from your forehead; it's up to you though! Once you've decided, pin them down (being careful not to skewer your scalp) then remove your hat and sew the horns onto the hat. For the record, I have no idea what is going on with my eye in this photo; it must be that hat....... it's evil!!! Wow! Exactly the pattern I needed! Making a Chicago Bulls hat for a wee new fan, and your horn pattern did the trick! Will post on my Ravelry page when done: ktdid. Thanks!